$20 per person (includes food! )Come by to mix and mingle! Specialty Drinks, 50/50 Raffle and more! 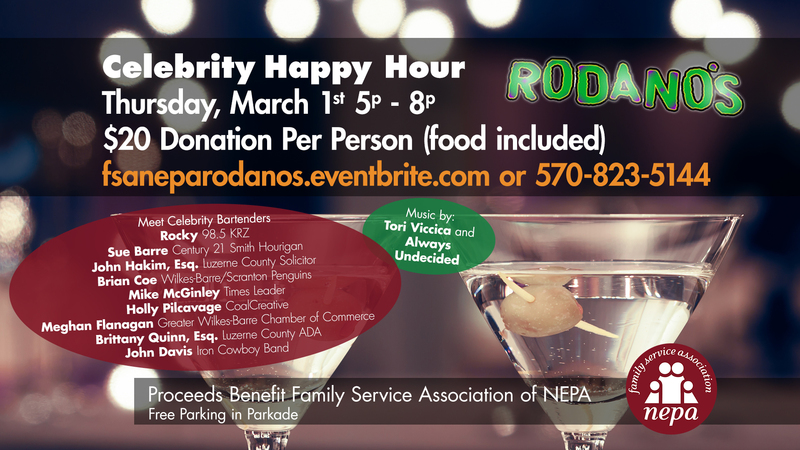 Please join us for Celebrity Happy Hour at Rodano's from 5-8PM on Thursday, March 1, 2018! Music by Tori Viccica and Always Undecided. Proceeds raised will benefit Family Service Association of Northeastern PA.
$20 per person (includes food!) Come by to mix and mingle! Specialty Drinks, 50/50 Raffle and more!